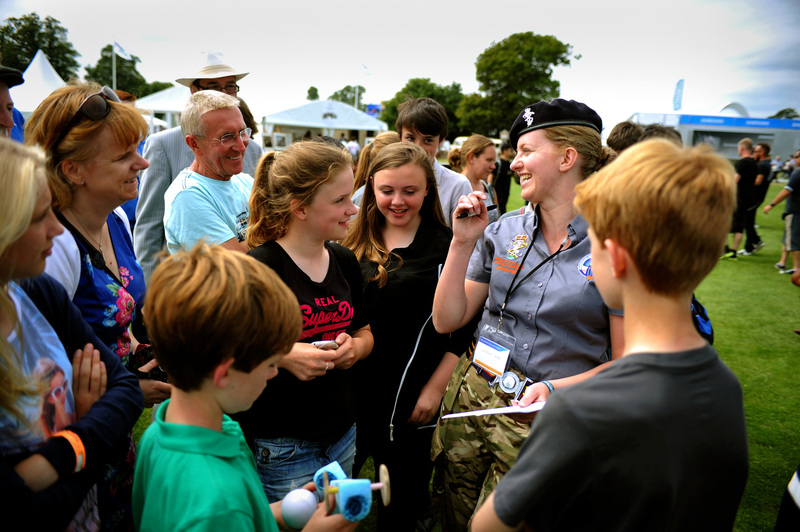 REME Reservist Craftsman Liz Brown getting kids to calculate the speed of rocket cars on their mobile phones. “I get it – I finally get the equation”. The words of one of the 300 children invited to take part in the Bloodhound Rocket Challenge at Goodwood Festival of Speed. What did she get? The penny had dropped for this 12-year old, who is starting to make choices that will shape her academic pathways, that the crafting of a foam rocket car hurtling along a wire at 120 mph had a direct impact on the speed. There’s an argument to say that family, friends and the subjects she is confident in have already set her on a path that may take her away from STEM* careers – so today has never been more important. 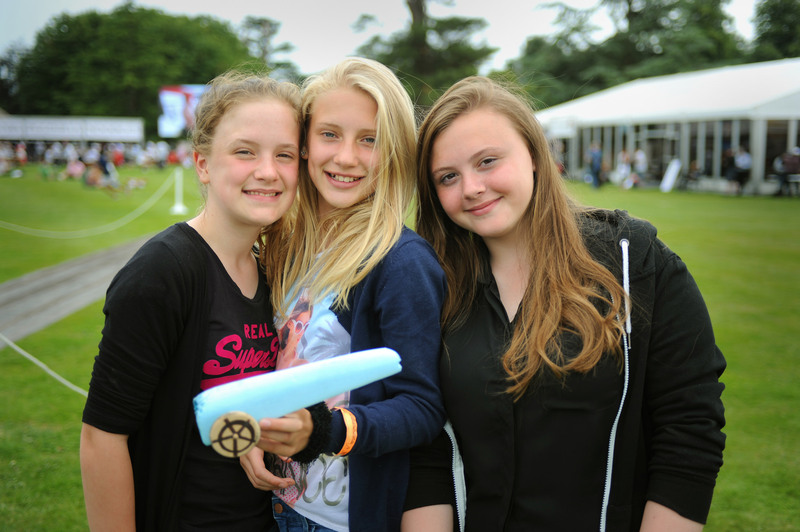 The team of three girls from Twynham School, in Dorset, turned up to Goodwood prepared – tool boxes, plans – they were not taking any prisoners. They wanted to win. The foam rocket car they had so carefully crafted shot up the track – surprising the adults and momentarily silencing the young students. Smoke from the rocket motor and then the impact of the car – the same weight of an apple – into a soft barrier to keep the cars intact. The car stopped and the girls were off, sprinting up the 50-metre track to see what the heat from the rocket motor had done to the foam car. Had they removed too much material? Had it melted through? The car had gone down the track so quickly that the rocket motor was still burning and had set light to the soft barrier – this was “epic” according to the girls and was certainly not what normally happened at school. The flame was stamped out and all eyes focussed on the rocket car. The front wheel of the car was gone. “What happened?” “Where has it gone?” The girls started discussing what went wrong, how it had happened and if had slowed the car down? What followed was an impromptu lesson on speed=distance/time. Teacher Amanda Britton who was accompanying the girls watched on as Liz drew out the S-D-T triangle and mobiles were pulled out to work out the speed. Craftsman Liz Brown recently joined the Army Reserves and is “cool” in the eyes of the three girls because she is training to repair weapons systems in the Royal Electrical and Mechanical Engineers. “Once I’ve qualified, the guys will bring in their rifles to me and I will be responsible for fixing them” says Brown when quizzed what she does. The girls get the significance of Brown’s role and eyes are fixed on her as she tests their calculations. “If you are dividing metres by seconds, what do you get?” Next is an explanation of m/s and mph and some homework via Google on the journey back to Dorset. As they walk away we overhear, “I get it – I finally get the equation”. Mission accomplished. In the space of 2 hrs, Bloodhound’s rocket challenge has linked the shaping of a blue Styrofoam block to aerodynamics, rocket science (chuck in chemistry and a dash of Newton’s laws) and a lesson on speed calculations that will adhere to a mind filled with much more than school work. Bloodhound’s rocket challenge is simple but powerful. Outreach projects like this, and others that the Bloodhound team have up their sleeves, are challenging kids’ perceptions of what is achievable and how they access Science and Engineering. Bloodhound has the ability to inspire – and kids get it. 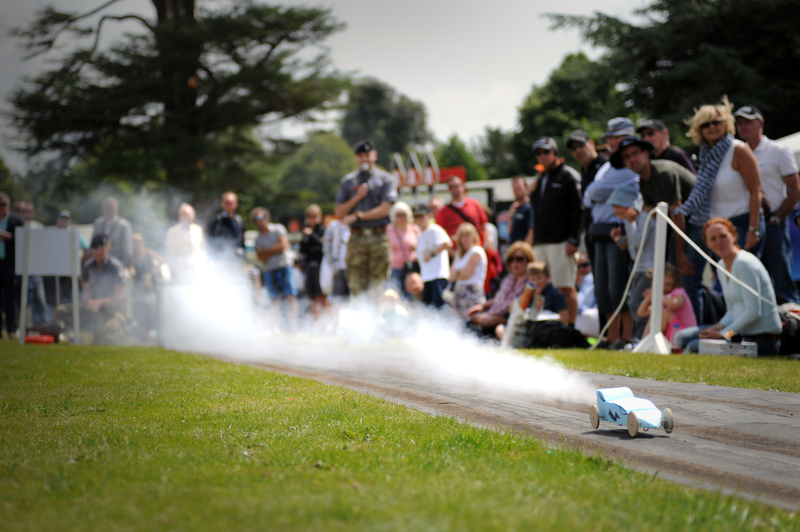 The rocket challenge coincided with an announcement from the Army at Goodwood’s Festival of Speed to support Bloodhound’s education program. The Army has trained 100 soldiers as part of a volunteer force of Educational Ambassadors to take the 1,000 mph car’s cutting edge technology into schools. Soldiers from the REME have been visiting schools across the country in support of Bloodhound’s professional educators – all in an effort to offer every child a lesson on Bloodhound by 2018. So far 40,000 children have received a lesson on the supersonic car. The announcement reaffirms the Army’s support to the Bloodhound project, which already has a small team of military technicians seconded to the engineering team under a commercial arrangement to help build the 1,000 mph car. Ask your kids if they have heard of the Bloodhound project – you will be surprised at how much they know! *Science Technology Engineering and Maths.